Grand lighting fixture befitting your grand home. 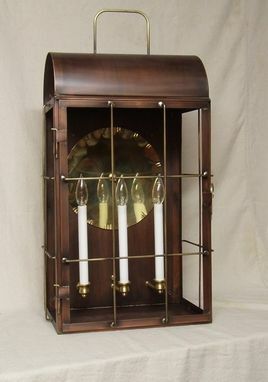 Three candle sockets with a maximum of 180 Watts. Standard Edison base sockets also available in this fixture. Copper Finish Choices: Choice of Hand Rubbed Finish or Green/Blue Patina. Wax finish: Hand Rubbed Antique Copper Finish with wax is best at ocean locations. This finish will patina over time. Suitable for wet locations, Hi-pot dielectric tested premium Leviton electrical components insure a safe outdoor fixture. Dimensions: 26"tall x 16"wide body with a 9" projection. 30" to top of the handle.